Barbara Klaskin Silberg (aka Mrs. Music) has written beautiful music to accompany Francis Bellamy's Pledge of Allegiance. Recorded by Mrs. Music's renowned West Los Angeles Children's Choir, this beautiful piece can now be sung in every classroom! What a great way to introduce the Pledge to students, break up the monotony of daily recitation, and engender national pride and respect. 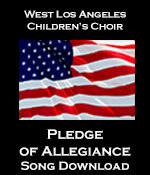 Printable lead sheet music for "Pledge of Allegiance" is also available below.